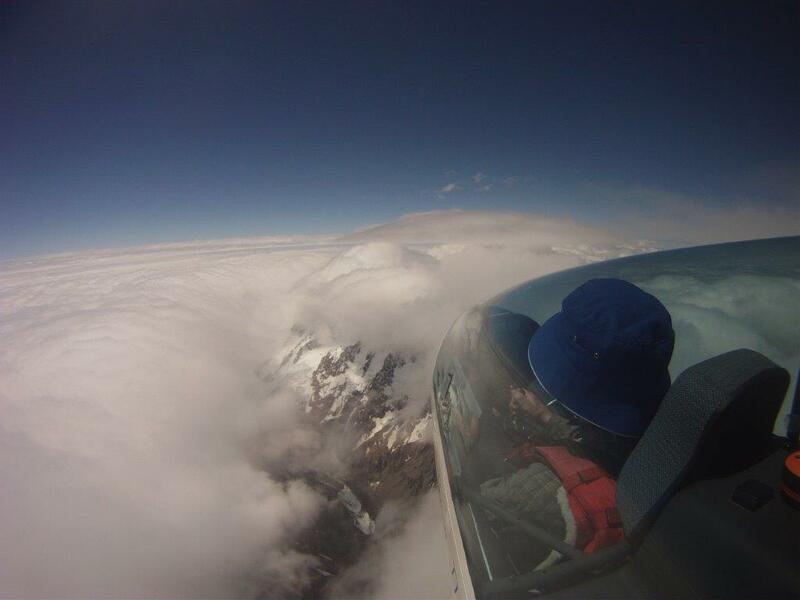 Returning from Antarctica, pack ice delays meant I went straight from Hobart to Omarama, a few days late for my appointment to go gliding with a local from Queenstown who has been flying various types of aircraft since he was 14 years old. It was a great way to kick start my adventures, not to mention appreciating the fantastic hospitality of locals, friends old and new. It’s a different type of flying to what I’m used to. Wave flying is a bit removed from it all. But it’s great to be able to read the sky like Chris can. He talks of wave effects “shaking hands” with sea breeze convergences or other influences, and this kind of thinking is one of the key things I wanted to get out of the experience. Transitioning from a thermal in the bumpy underworld I’m used to into the silky smooth wave “dream time” land is often the crux of the problem. Generally you need a strong climb to break through on the upwind edge of a cloud. It is something I will keep in mind in future paragliding flights, as at times we were in wave with only 10 knots of wind well above 10000′. 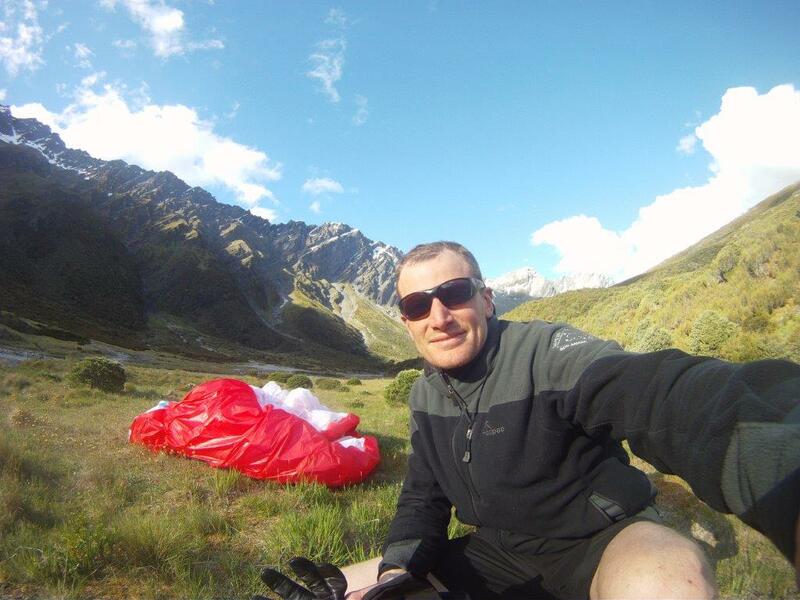 I also wanted to see more of the New Zealand mountains and find out some of the secrets of the local air. For this I only got a glimpse in through the clouds. In fact we were very mindful of being stuck in no mans land as the stratocumulus started to spread out beneath us, approaching 8 octas. 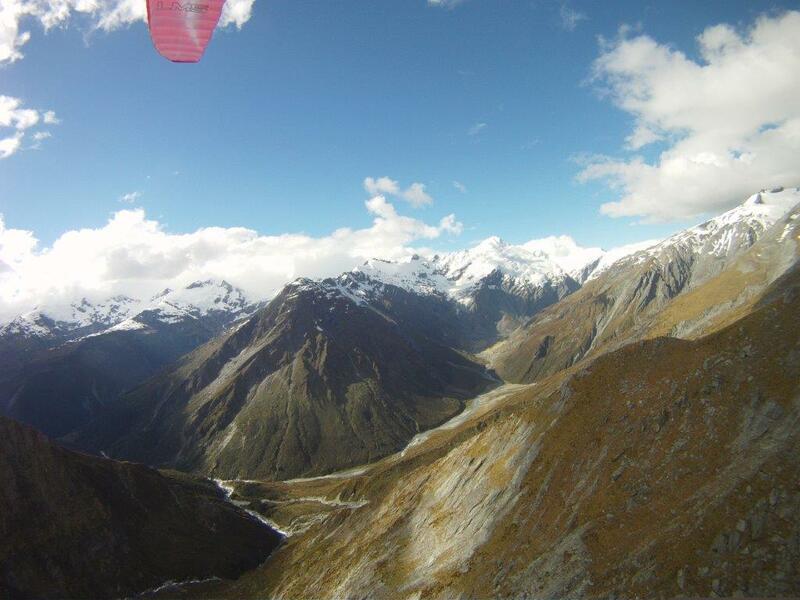 But in the following week Chris managed a solo flight down to the Dart valley in blue skies and thermic conditions, returning along the divide as far as Mt Cook. 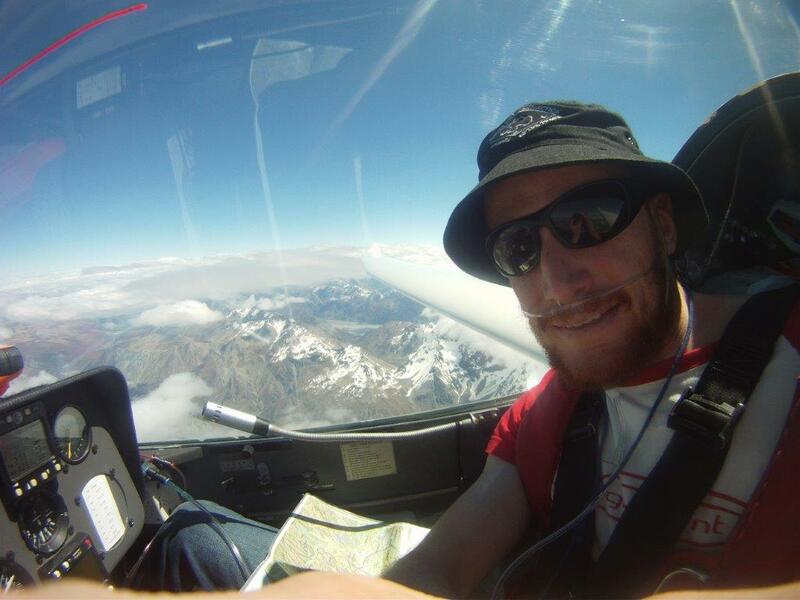 It’s expensive to fly this way but it would be worthwhile if living in a fixed location with limited time off work – another advantage of sailplanes is that they can be flown in a wider range of conditions. 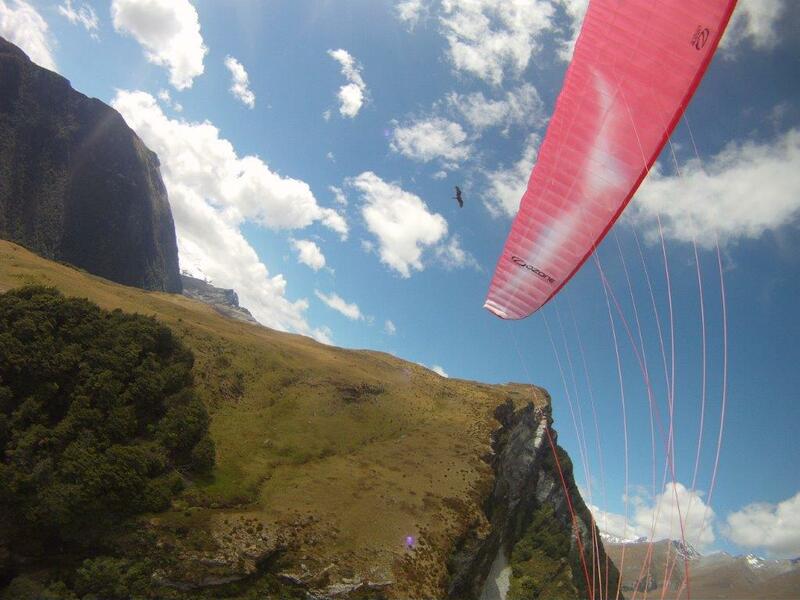 I was also excited to try my new wing, the Ozone LM5, as in the 2013 xalps race. 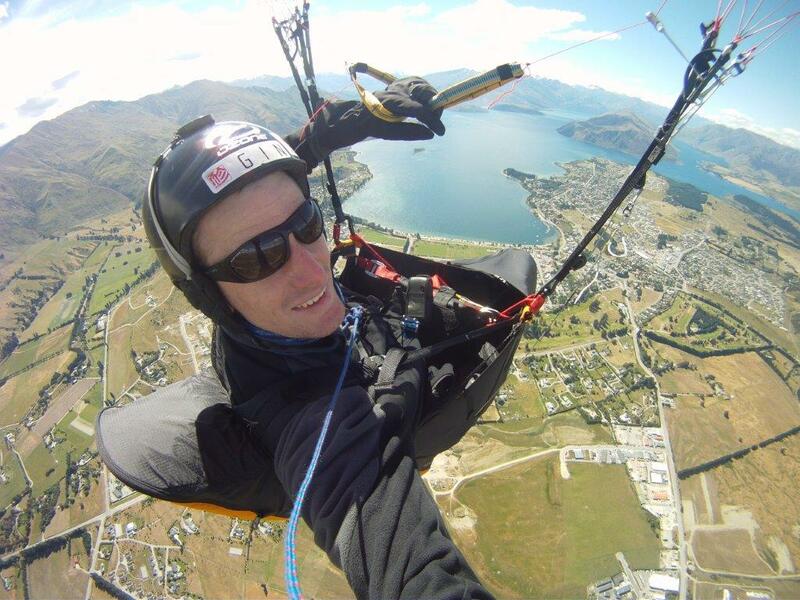 I christened it with 45 minutes in bubbles at a shady Coronet peak – a place I’d only flown in weak conditions. A few days later I returned on a day with a bit more sun, but still didn’t expect to go anywhere due to the wind. Then after a good thermal or three, drifting leeward of spurs, over radio I agreed to follow Louis toward Wanaka. After gliding to Soho I realised I would get very cold if I didn’t top land and dig into my vol biv gear stashed in the seat of my harness. Still I had no food so I was a little nervous as I battled broken thermals and valley wind lower on the spurs above the hot Macetown valley while Louis climbed off the peak and glided to Cardrona. 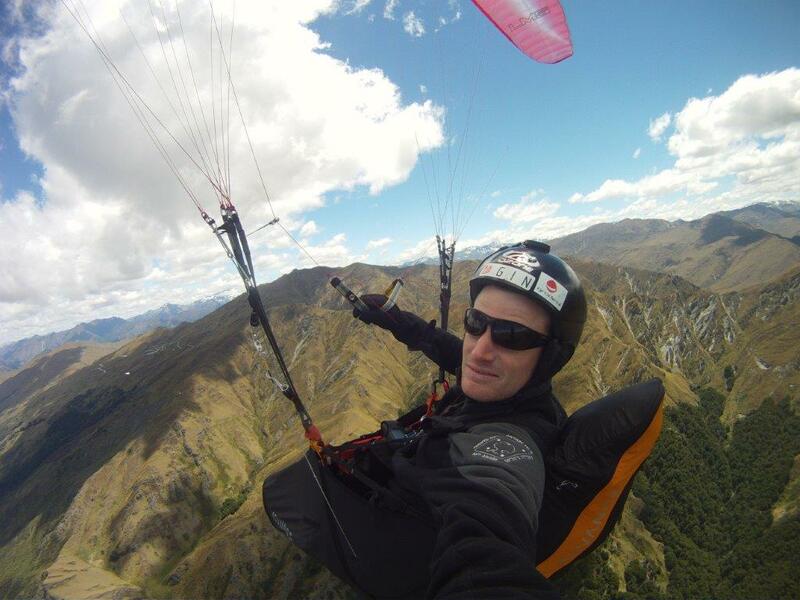 Later I caught him and sailed over the top, pushing bar to advance in the 15-20 knot headwind to Wanaka (some decent lift on the way improved my glide enough for very pleasurable wing overs over the lake). I landed and sent a text to Rob (Wanaka local) and we had a bite to eat before I hitched back to Queenstown with an ex airforce guy running a lake swim business. A couple more lifts (one a friend of a hangie I’d met at Omarama) and I was back at Louis’ car, which he kindly offered to me to use as he was still walking back to the road to hitch! 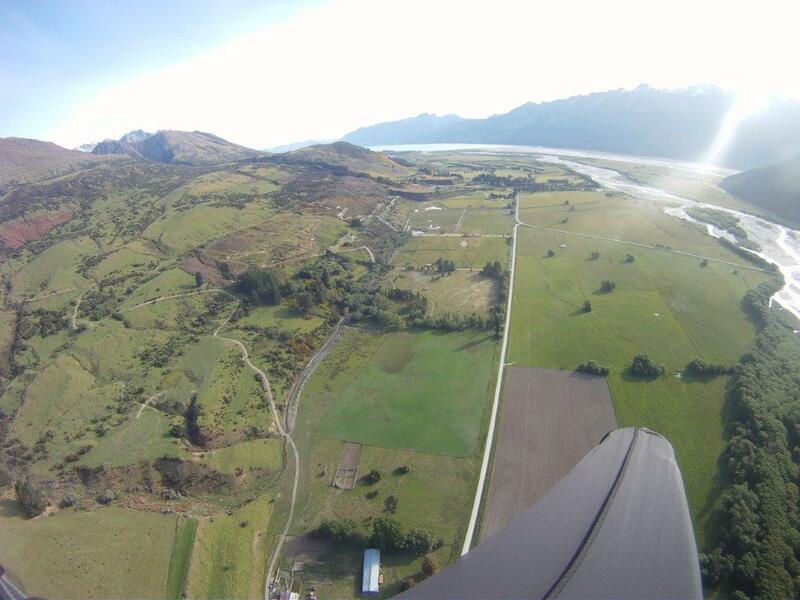 Enroute to landing at Wanaka – didn’t expect that! It’s great to see new country but the most impressive scenery of course was the snowy peaks of the divide and this is where I yearned to return. 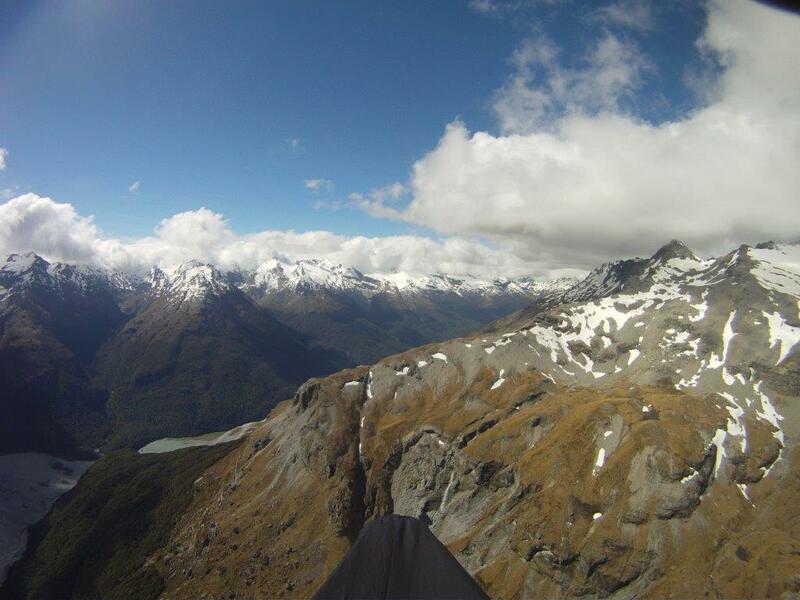 My next flight was from just above Sugarloaf pass, over the Routeburn car park where I’d walked from that morning. Muggy air and big clouds spitting light showers prompted me to launch early. It was an interesting thermic ride, influenced by descending winds meeting valley breeze. I got a few climbs over the grassy car park flats but had less luck on the sunny slopes behind and soon after I landed at Weka flat. A one kilometre walk back to the car meant there was still time for an afternoon flight. I had been eyeing up a treeless gully beneath a gorge through enormous west facing cliffs under Turret head. But the southerly valley breeze meant the easier option was Lovers leap. After only twenty minutes walk I launched at 4pm and sailed up the slope for a fast cross country. The familiar yet still sensational scenery and the easy travel put me in a very good mood indeed and made me think of very nice things to say about Ozone’s lovely product and Gav for getting it to me. To date my main concerns when flying are still probably more concerned with performance (eg reaching landings, getting blown where I don’t want to) than handling (erratic wing behaviour and turbulence). While cautious on the controls around terrain (one reason for my wing choice was to promote maintaining good habits) I have been given no reason to be more concerned flying the LM5 than any other wing. While I was reasonably confident of my choice of wing I was waiting on experience to assuage my doubts. With cloud banked up on the western side of the divide the Dart valley was wide enough to have sunshine on these western faces all day. I’ve soared them before, late in the evening, and it was no less spectacular today. But getting to cloud base at 7000′ I had to decide whether to push tailwind past the corner and commit to a potential night in the backcountry. I couldn’t face giving up that opportunity so on I went. A convergence had set up and I tried big ears – occasionally a wingtip cravat forms, more easily cleared with a jab on the brakes than the stabilo line. Good lift continued despite using bar and when I finally left the cloud I was quite a way below base and over the middle of the valley. Therefore I didn’t have height to jump over directly into the Rees valley and the west facing Richardson range, an option that would have no doubt saved me the next days ten hours on foot. Instead I soared faces on both sides of the Dart just downstream of Dart hut. I continued on finding a climb low over Dart hut with the Dart glacier and Mts Edward and Aspiring crystal clear and larger than life. Then I pushed into the westerly before finding myself low on the wrong side of Rees saddle. Landing I walked rosette in hand to relaunch at the head of the Rees. Having forgotten tucking my pod foot plate under my bum (easier to walk) I had a very uncomfortable abdominal workout whilst flying as I tried to regain the height I’d lost trying to pull it from under me, alternating between wedgie pose and lying back looking at the sky as I ridge soared back up to face land between characteristic angled schist bluffs. I don’t think I’ll forget that again! The LM5 responds very well to a tug on the D’s (C’s as it is a three liner) and felt under my full control launching in moderately strong winds. Following the valley around I arrived just a little late and low to get up on the Richardson range but landed happy, just before sunset at Shelter rock hut. A few had seen me come in including a German Paraglider pilot, actually a student of Burkhard Martens. I was even given beer carried in by some tired and sore Britons who hadn’t quite realised that this wasn’t just another Abel Tasman walk. I wasn’t that keen on walking the never ending Rees either, and (the next day) tried twice to find a launch, despite overcast spitting rain (first time, low on the Richardson side 15 min above the hut) and gusty downslope down valley winds (both times). At Kea basin thermals were influencing the strong energetic unstable air mass and had a decent launch spot not been so inconvenient to get to I may even have considered launching. Definitely not conventionally flyable however, as back in the valley it was a gusty 20 knots plus down valley, until nearing Muddy creek where after a brief lull it came in with equal intensity from the opposite direction! Great for sailplanes of course and Chris informed me later that he’d passed overhead that day. Meanwhile on foot I decided to walk all the way to my car making a ten hour trip and feeling every last hump of the stupid 4wd track opposite the Muddy creek road. This made the next day simply more enjoyable however. Back to Lovers leap, and the falcons don’t take the slightest consideration of your having obtained permission from the land owners. The same southwesterly that had dissuaded others from flying offered gentle lift up the slope, although getting high and away was harder, much to the chagrin of the unrelenting falcons. Finally I decided to let them be, abandoning the Rees and gliding past the Earnslaw burn to the spur besides the Dart. It was working but it was touch and go which side to take. In the end I chose the Dart side and soon I was defeated and gliding to the flats, observing white caps on Diamond lake. I stuck with it though and got a good climb from under 2000′ amsl up to 5500′, sans vario as the batteries had just expired. The air was lovely (so stress free without beeping noises) and I continued past Mt Nox. Sliding into the lee behind the Cosmos peaks I got some rough air and full frontal threatened for a split second. I decided to push back to a river flat, hoping my glide (full speed bar) would get me to the right (true left) side of the river! A jetboat full of passengers watched me come in and yelled and waved when they passed me moments later. Royce ran up to say hello, he’d been dropped off on his day off to go hunting and radioed in to organise a jet boat ride out for me. Fantastic! It was a little ironic that I couldn’t repay the favour by pointing out two deer grazing just across the river only fifteen minutes after he’d left. I had a huge grin all the way back to Paradise and laughed at all the jet boat drivers’ jokes as his stunned mullet passengers sat by. From Paradise the first car picked me up meaning I still had time for an evening flight (greedy!). Off up Temple peak slopes until a thermic cycle lulled me into the air. In light air the sub 4kg wing launches beautifully, you can get it up from a rosette and even well off centre with half the wing collapsed you can coax it back into position. This helps alleviate my main concern about the wing – damaging it through physical contact – although how it will fare with the falcons in future I am still not sure. I also like the statement someone made that handling on launch is indicative of how it will behave in a recovery situation. Anyway, losing the plot I landed on the wrong side of a small gorge and it was 7pm before I could relaunch, a little higher this time. Too late to get up for a high traverse along the convergence to Mt Larkins, I settled for wafting thermals over the landing paddock before some last wing overs. Lately the wind has been more suitable for kiting but all these things to do make a life of leisure a rather hectic business, so nearing midnight I’ll leave it there. 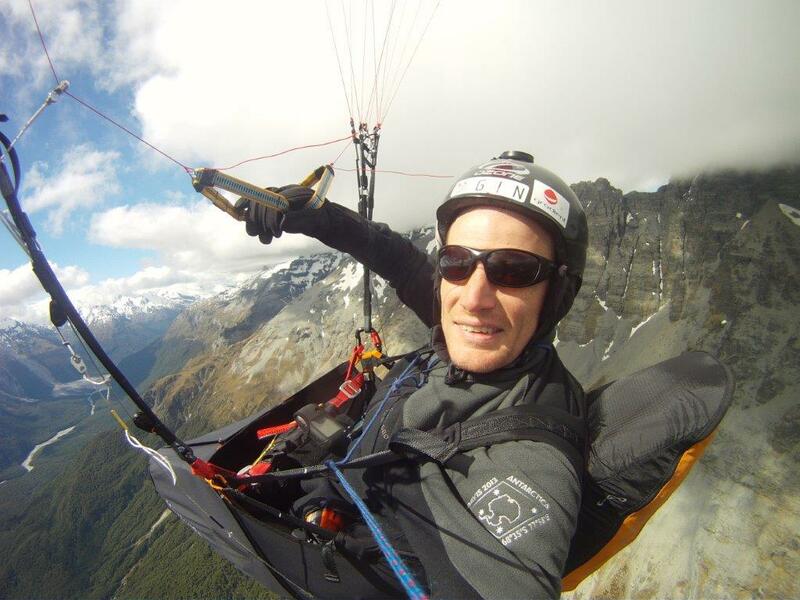 This entry was posted in Uncategorized and tagged adventure, flying, Gliding, mountains, New Zealand, paragliding, parapente, Sailplanes, share my joys. Bookmark the permalink. 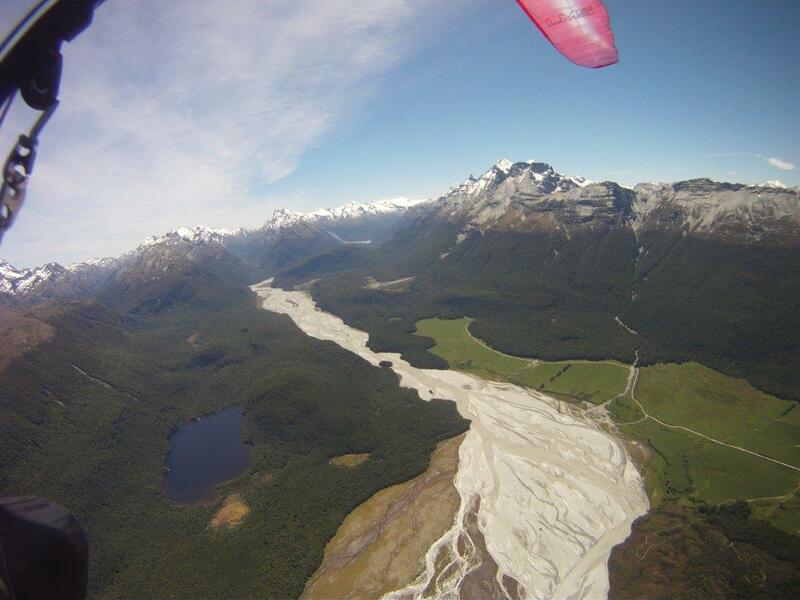 Thanks for the new stories from Kiwiland, you certainly get around and making up some lost air time, the LM5 sounds like its right up your street, keep the reports rolling. 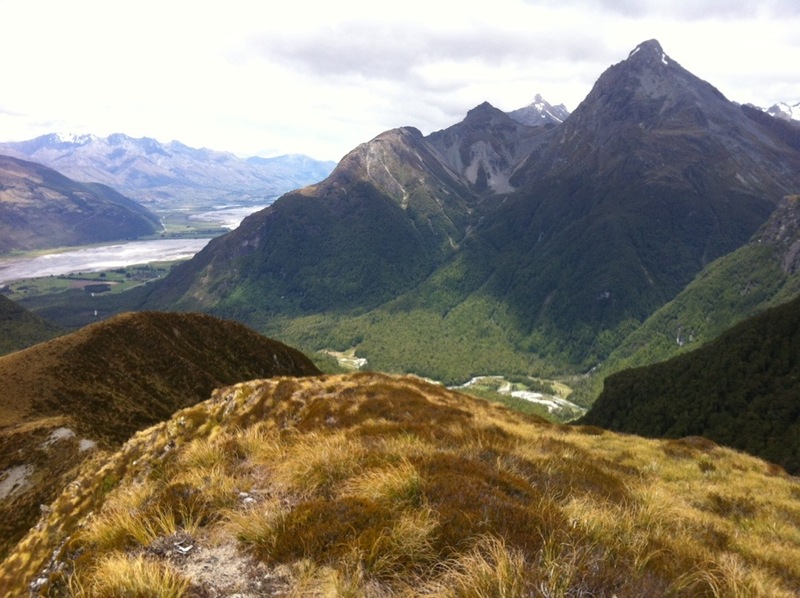 Pingback: More on the end 2013 New Zealand trip | Put on your boots and go!